Lebanon for whom the artist has led programming on the use of art to empower. Hear from volunteer docents from Christie’s about the children’s artwork. WHITNEY INTERNTIONAL FINE ART, INC.
“Beauty itself is but the sensible image of the Infinite” mused Sir Francis Bacon. New York based Madeleine Schachter's multimedia art follows in this emotional emphasis through its demure palette and explosive motion. Exploring theamorphous concept of form, Ms. Schachter’s multimedia paintings blend sharp focus and obscured detail in order to create a depth of field that tricks and pleases the eye, allowing the viewer to form a deep, spiritual connection with the vast and seemingly endless space depicted within. Comprised of a delicate, subdued palette imbued with glints of gilded tones, Ms.Schachter’s compositions imply movement, precision, and utmost beauty, as her minimalist compositions explore both the artistic and philosophical journey to finding and understanding the light. Madeleine Schachter’s oeuvre takes viewers on a visual odyssey between dream and reality, offering just enough evershifting detail to blur the lines of how each obfuscated image is experienced. This beautifully executed and lovingly rendered style creates a realm unto itself that transcends expectation, seemingly changing at every second glance to create something wholly new to experience and enjoy. These expressive, abstract portals to her surroundings reflect the powerful foundations of emotion expressed through a saturated color palette and dynamic brushwork. Imbued with glints of gilded tones, each of Ms. Schachter’s pieces implies movement, infused with buoyancy and sensation that diverges from a language ofpragmatism and precision. Suggesting abstraction, the viewer is endowed with prospect and possibility, entrusting that implication will arouse contemplation to enable unique flights into self-reflection and sentiment. Working in unexpected and innovative mixed media, including pastels, watercolors, acrylics, metal leaf, and glass crystals, and mascara, Ms. Schachter’s paintings command presence through their texture. Through texture, her paintings elicit response, focusing on the extensive relationships between line, form, color and texture as her non-objective canvases symbolize the dynamic and exciting ways one can experience a visceral response. By layering splatters, drips or even flinging specks of paint onto the canvas, texture expands the two-dimensional canvas and enters the space of the audience. For Madeleine Schachter the spatial existences of her canvases are composed through her dynamic style that burgeons through an interplay of light and dark, boldness and softness. Appearing minimalistic in style, her deceptively complex compositions are comprised of atmospheric hues infused with geometry and gesture that incorporate elements of both the feminine and the masculine. Madeleine Schachter is Assistant Professor at Weill Cornell Medicine, where she teaches Medical Ethics and Advanced Clinical Ethics, a member of the Ethics Committee of New York Presbyterian Hospital, and a lecturer in Bioethics at the Albert Einstein College of Medicine. Previously, she practiced law for 30 years, most recently as Partner/Global Director of Corporate Social Responsibility at the international law firm Baker & McKenzie, where she worked exclusively on global pro bono and community service, diversity and inclusion, and sustainability matters with the firm’s 4000 lawyers based in more than 40 countries. We are honored and delighted to announce an updated schedule of events by our treasured artist Madeleine Schachter. American painter Madeleine Schachter is a multifaceted artist known for her dramatic and ambitious expressionist works. Schachter’s work excels through her subtle reinterpretation of art historical and contemporary cultural references. Using a fresh and modern palette, the artist investigates highly complex subjectivity. Her work explores the mechanics of humanity: from sociological issues, and the human condition to inspirational narrative that provides a much-needed hopeful perspective so rare in contemporary art, with paintings that are simultaneously lyrical and mysterious, jubilant yet pensive. Employing these paradoxes, she skillfully applies linear movement, shape and pattern, creating unique arrangements that elicit a vocabulary of nuance. A brilliant colorist with a penchant for vibrant shades of rose, emerald and azure, she stands as an art enigma - an abstract expressionist artist whose subject matter is anything but abstract. Schachter is an artist who inhabits the discreet space of the in-between, where her visions, (sometimes monolithic, sometimes intimate) always speak directly to the viewer. Art Productions is pleased to announce several amazing opportunities to see this rare talent. Please note the exciting new schedule of events for the artist. From her exhibitions in Marbella, Paris, Shanghai, London, New York, and Miami this year, to next year’s exhibitions in Bologna and multiple NYC shows and fairs, Schachter is a force to be reckoned with! The most exciting developments will appear at the newly scheduled Collectors Collection Group Exhibition, originally scheduled for November 2018, which will now be held in conjunction with the Armory Art Fairs Week 2019, during the most important and influential week of the art calendar. Madeleine Schachter’s latest works will be presented at the exhibition which showcases the artist’s next exciting visual chapter. Along with her thrilling exhibition developments, Schachter’s paintings continue to evolve! While her works have always had the swirling energy of many great Neo-expressionist art, her latest pieces also suggest something quite different: the murmuring of numerous voices beneath each layer. The artist’s work has evolved to its current dynamic vocabulary. She courageously goes beyond the given and familiar, pioneering new techniques, approaches and ideas in order to expand her own vision, and that of the viewer. Informed by her own accomplished academic and legal backgrounds, she is an internationally collected, published and exhibited artist. Madeleine Schachter has established herself firmly as a generous creative talent who not only shares her gifts freely but is also known for her philanthropic and humanitarian work. Art Productions is proud to represent this emerging cultural asset to the contemporary culture and history of American art. Indeed, her creativity is a never-ending process of back and forth that involves a give and take between expression and interpretation. 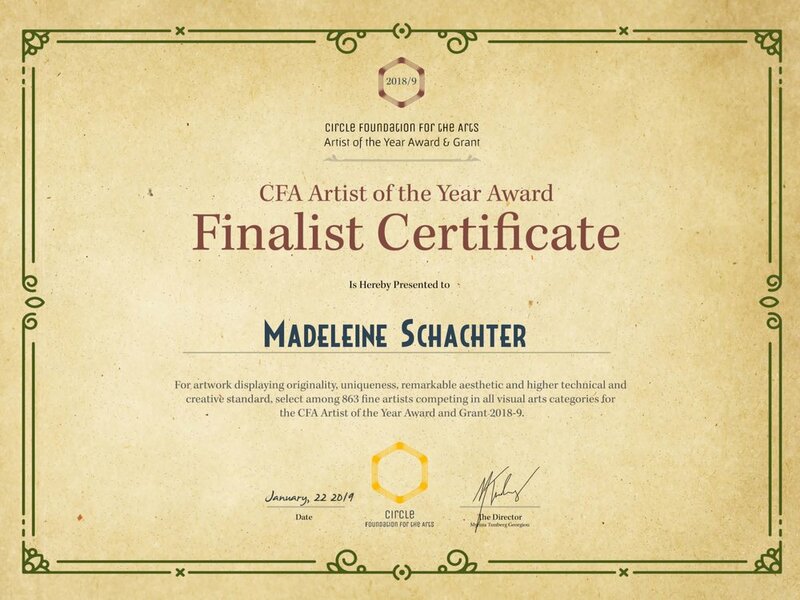 It is her generosity as an artist and as an individual that proves Madeleine Schachter recognizes the power of visual form and its ability to connect with both individuals and cultures.